This morning, we had an amazing fishing trip! We are back at Ft. Stevens for a few days. Rob and Patsy got up early and went over to Coffenbury Lake, which is very close to the campground. They fished for a while, and then I walked over to join them. It quickly became apparent that the fish were biting!!! In fact, Rob had just finished his 5-fish limit right before I got there. 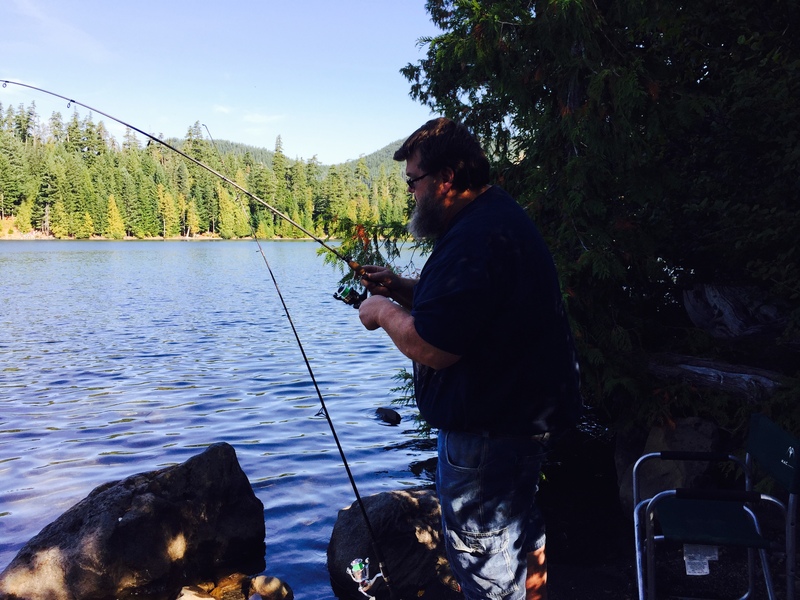 I had Rob run back to the camper in the van and grab my fishing license, which I had forgotten over there. While he was gone, I helped Patsy continue to fish. She got 2 more while he was gone. We were sharing the dock with another man, and he said he did not eat trout, and asked if I wanted the one he caught. I accepted happily! Rob came back with Ja’Ana, who chose to read a book instead, and then patiently waited while Patsy finished her limit. At this point, I had still not caught a single fish, but finally got one as Patsy was finishing. I wondered if they had stopped biting and if I was too late. Much to my surprise, I was able to limit out, too. It took me about an hour. We were using rainbow power bait. We have had success with that in other places, as well, and the fish sure loved it today. We went back to the campsite with a total of 18 fish–15 from the 3 of us who fished, and 3 from the kind man on the dock. I froze 2 ziplocks of 4-fish each, kept 1 bag out for dinner in the next couple of days, and gave 4 to the people camped next to us. They were really happy to have some, and we were happy we had so many and could share. We had such a pleasant time fishing and it was very fun to catch so many. We hope to do it again, soon. In September, we went camping at Lost Lake, near Hood River, Oregon. The weather was spectacular and the fishing turned out to be good as well. Rob was having success with Rainbow Power Bait one morning while we were there. On that morning, he caught a 8-10 inch trout, and Becky caught one as well. Then, the morning was filled with excitement as he was able to pull in a huge one, which measured out at between 19 and 20 inches in length! 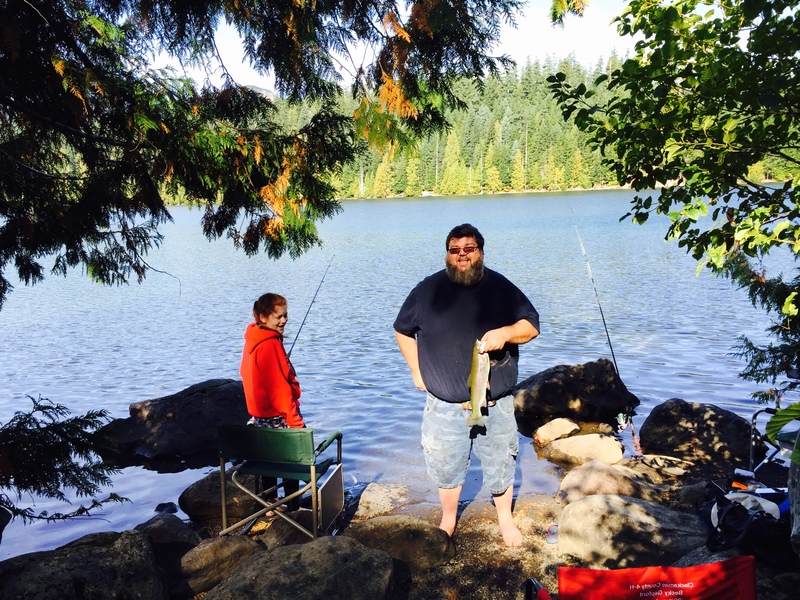 We had so much fun camping and fishing!